My personal top twenty-five list. Honorable Mentions: She's Got A Way, Everybody Loves You Now, Stiletto, Zanzibar, You May Be Right, It's Still Rock and Roll To Me, Closer To the Borderline, Allentown, Goodnight Saigon, A Room of Our Own, Easy Money, Keepin' The Faith, The Night Is Still Young, A Matter of Trust, Getting Closer, The Downeaster Alexa, Leningrad, When In Rome; Air: Dublinesque. Amazon.com preview of my top twenty-five. "Piano Man" was Billy's first hit, reaching #25 on the charts. Released in 1973. "The Entertainer" reached #34 on the charts in 1974. "She's Always A Woman" charted in 1977 and again in the UK in 2010. Billy's first song to hit number 1 on the charts was "It's Still Rock and Roll To Me" released in 1980. "She's Right On Time" from the Nylon Curtain (1982). "And So It Goes" from Storm Front was a modest hit (1989). "Lullabye (Goodnight, My Angel)" is one of Billy's most popular ballads (1993). 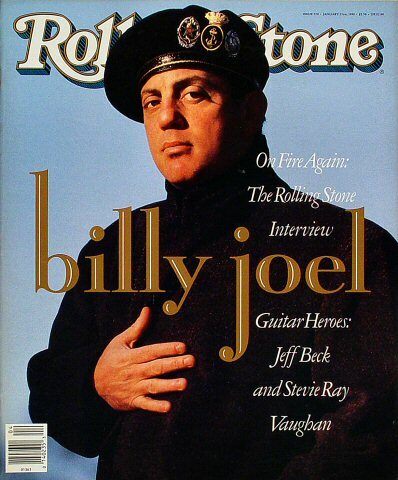 Billy has been on the cover of Rolling Stone in 1980, 1982, 1986 and 1989 (above). In March 2013, Vulture put out a list of the top twenty "forgotten" Billy Joel songs that "haven't been played to death." They are, in chronological order.